Yesterday, Microsoft launched its high-end and high-priced Surface Studio, with a 28″ multitouch display which tilts down to form a 20˚ drafting table. Tonight, Apple will no doubt reveal its enticing new Mac products. But it will be several years before we know the true cost of any of these new devices. As with virtual reality and augmented reality, there is a significant gap between what can be accomplished by current (or future) technology, and what our bodies can cope with in comfort. I know a lot of people who often work intensively for long hours at their computers, and none of them puts their keyboards and input devices as close as possible to the display. We all know, sometimes not particularly consciously, that our fingers are much more comfortable if they are working in a different place to where we are looking. This is an issue which is already troubling many of those who rushed out and bought a 12.8″ iPad Pro. Try working for eight to twelve hours on one using the stylus, and you either end up with gorilla arms or a pain in the neck. Keep doing that for five or six days a week, forty-odd weeks a year, and the results are not encouraging. The proven approach to workstation design. Yamavu via Wikimedia Commons. 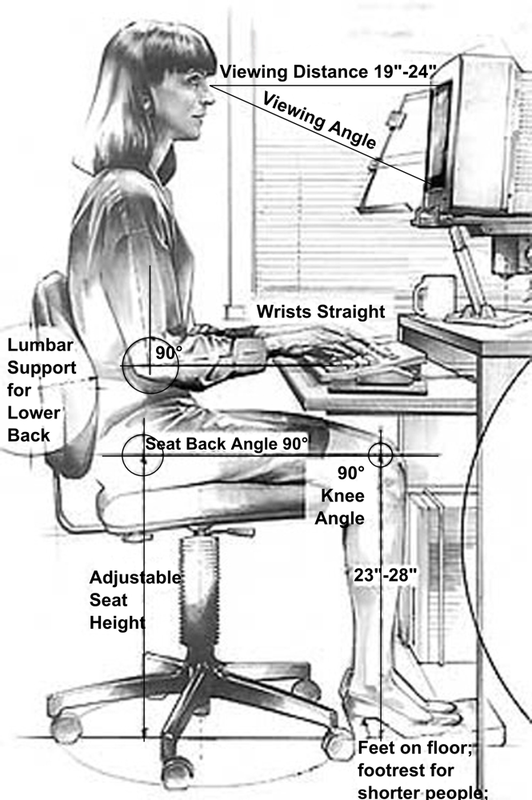 The reason for this is anatomical: when we’re doing sustained work with our fingers, our wrists need to be supported at a level so that our arms are in a relaxed neutral position, in the classic ‘workstation’ posture. If we are to look constantly at what our fingers are doing, say on a touchscreen display there, it means that our head will be angled downwards rather than looking straight ahead. The only way that we can manage that is to flex the neck. This requires our neck muscles to support the weight of the head at that angle, rather than stabilising an erect position. We have not (yet) evolved to do that. Let’s walk this through, based on Microsoft’s alluring video-clip of a standing man gently touching the Surface Studio display to tilt it into drafting table position. I’ll be generous, and assume that he has returned from a break. Prior to that, he was using his Microsoft Surface Studio to catch up with email and keyboard-based tasks, for which he was seated in the perfect workstation posture as shown above. Now, he is going to do some design work, photo-editing, or other stylus-intensive tasks for several hours. He tilts the display into its drafting table position, and sits down in his ergonomic chair, designed for keyboard work. Now he can neither see the display nor reach it with his stylus, and his wireless keyboard is in the way. So he moves the keyboard to one side, and pulls the display closer to the edge of the desk. As it now stands, he is going to get gorilla arm from reaching over the display to work on it, back pain from leaning forward, and neck pain from bending his head down to see the display better. To solve the gorilla arm problem, he needs to raise the height of his seat, and move closer to the display. This then makes his back and neck problems worse. Perhaps he abandons his chair altogether and tries to work standing, bent over the display, which might help his arms more, but worsen his back and neck posture. Instead he might try that for thirty minutes or so, then rest his back and neck by bringing the display to a more vertical position and killing his arms and shoulders for a while. Eventually he might try sitting in a much lower chair, with the display held as a tablet, on his lap. That takes the pressure off the arms, but he gets it in the neck. If you’re his employer, you should be worried that in a few years, his lawyer will be writing to you seeking damages for your failure to protect his health and safety at work – just as happened so disastrously with repetitive strain injury (RSI). If you’re working for yourself, you should be worried how you will earn your living when your neck is so badly affected that you cannot turn your head or flex your neck, and how you can afford the very delicate surgery which might be required to alleviate your problems. I do hope that Microsoft finds a species appropriately evolved to make full use of its stunning new Surface Studio, and that Apple resists the temptation to shout “me too!” and make a Mac for aliens. Postscript: a number of individuals have insisted that they have used touchscreens like Wacom’s Cintiq for a decade or so without any problems. There were also children who survived scurrying up chimneys to clean them: the fact that one person is not affected says nothing about whether such problems will damage others. Touch screens are often very user-friendly interfaces, since users can feel as if they are directly interacting with their computer’s software. However, it is not ideal for a computer workstation to consist primarily of a horizontal touch screen, whether it is from a desktop, laptop, or horizontally fixed tablet. Instead, in accordance with ISO 9241-420:2011, a computer workstation should consist of a variety of input devices, and if there is a touch screen, it should only be used infrequently. In addition, manufacturers should follow ISO 9241-400:2007 so that their products conform to ergonomic recommendations. Posted in General, Macs, Technology and tagged Apple, ergonomics, injury, Mac, Microsoft, posture, Surface, workstation. Bookmark the permalink.